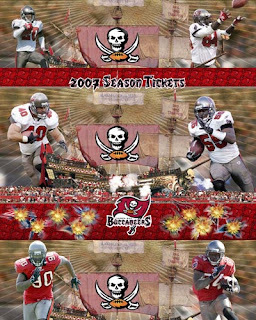 Lenticular printing produces animation effect on Buccaneers' season tickets, pictured above (thank you, Mike). Web banners from Tailgate that let users complete the transaction without leaving the host site. A few tips for students who want to break into the ad industry from OpenAd network. 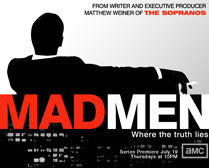 A reminder about the July 19 premier of Mad Men, a series about the ad industry back in the times when you still could smoke in the office (thank you, Angela). The Golden Jigsaw is an interesting online campaign where participating advertisers buy puzzle pieces to put on their websites and the traffic ensues (thank you, Alice). Could be the next Million Dollar Home Page, with any luck. 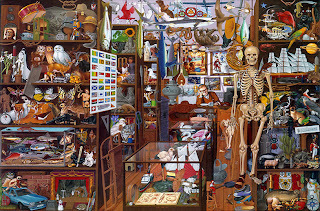 From the press release: "The image used for the jigsaw it taken from The Ultimate Alphabet, a book of 26 fantastical illustrations by British artist Mike Wilks, which was originally published in 1986. Each picture contained hundreds of items that began with the appropriate letter of the alphabet and the book was also a marketing first as it launched with a competition, offering £10,000 to the first person able to correctly list all the items in the book. The illustration used is the letter ‘S’ – reputedly one of the trickiest in the book and featuring more than 1,700 items." Can You Use Flickr Pics in Ads?